As true as the love symbolized by a red, red rose are the heartfelt memories and deep feelings embraced with this classic and elegant expression of tribute. • Two dozen red roses, accented by salal, are presented in an exclusive Noble Heritage Urn. 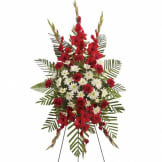 • Arrangement measures approximately 27" W X 26" H.
Flowers will be received by a Colyer Funeral Home's staff. They were beautiful. I'm very happy with my purchase. I would buy from them again. Thank you. THe rose were beautiful. There were actually two of these ordered and the florets added some leaves with white to ours so they looked a little bit different. Job well Done! The Rose Tribute was very beautiful, It was enjoyed by all who saw it well worth it. Thank you for your thoughtfulness put into this piece. The flowers were just beautiful. The arrangement looked just like the picture shown on the web site. Customer service was very polite and helpful when I called in this order as I wanted to add baby's breath to the Rose Tribute. 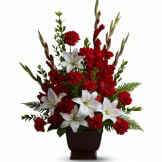 They verified all necessary info and made sure that the flowers arrived before the scheduled time for Visitation. The flowers were beautiful!!! My friends said the flowers were beautiful!!! Being thousand of miles from the funeral it was reassuring to be able to order flowers on line, that would be delivered as requested. 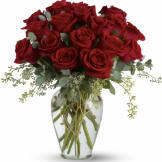 Flowers arrived on time and I was sent a picture of the Roses. They were beautiful and I hope it brightened some lives. Roses were beautiful, open and alive - perfect for a wake. Thank you so much! The arrangement was perfect in every way possible. The roses were stunningly beautiful. We could not have wished for anything more. Thank you very much for making this tribute memorable for our family. The flowers were beautiful and they arrived on time for the viewing. Outstanding service. Beautiful large roses, fresh flowers, nicely presented. It was delivered day before service, but it looked as it was just put together. Great job, it doesn't get any better. It exceeded our expectations!!!! At 9 o'clock at night we remembered a Memorial service for an out of town friend scheduled for 2 PM the next day. Your prompt and courteous service got our flowers to the family by noon that day. Beautiful flowers and beautiful service. 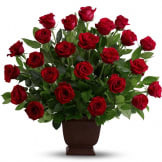 All of our flowers are designed and delivered by hand from a local florist in in Torrington.